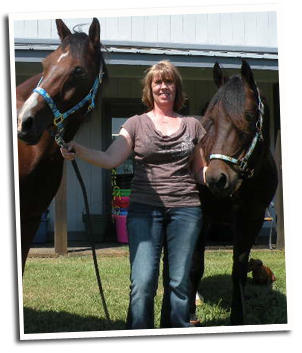 Vicky Schiller with her horses Cody and Duke. 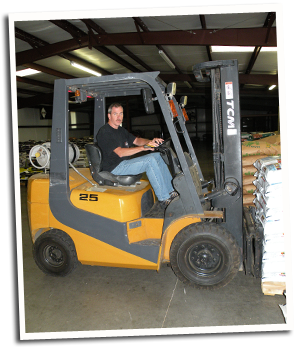 Jim Byrd, owner, rotating feed in the warehouse. Double LL Tack & Feed was started in 1980 by Leroy and Lynda Byrd. Already operating a horse boarding business in addition to breeding and raising Arabians, Leroy and Lynda were often asked where people could purchase quality tack for their horses. Seeing the need for such a store Leroy and Lynda opened the Double LL Stables Tack Shop in a 144 square foot building. What started out as a side venture has expanded over the years into a full time, full service, tack and feed store business. The business name has subsequently been changed to Double LL Tack & Feed since they no longer board or raise horses. Double LL Tack & Feed, is still family owned and is now managed by their son, Jim Byrd and daughter, Vicky Schiller. Although Leroy and Lynda have retired, they are both still active in several aspects of the business. The business consists of a 5,000 square foot building housing quality tack, equine health supplies, gift items, boots and more. In addition, there is an 8,400 square foot warehouse to store the various brands of quality equine and companion feeds. Also available are a variety of quality hays and stall equipment. Double LL Tack & Feed’s mission is to provide our customers with excellent customer service in a well maintained environment and a friendly, down-home atmosphere. Our goal is to supply the quality products, feeds and services our customers need to make themselves and their animals successful.